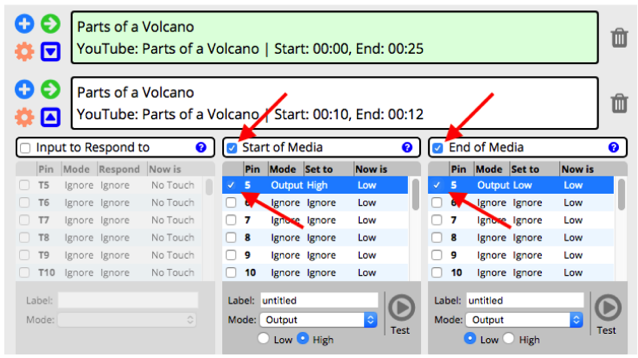 The MakerBit Media Linker constantly monitors the URL of the digital media content displayed in the browser, and with this, it can turn on and off LEDs only when a particular part of a video is playing, or even only when a particular image or Google map (or spreadsheet or slide) is displayed. To configure this, click on the "+" icon to add the URL for the webpage, YouTube or Google Drive video. After adding the media list item, click on the blue triangle to open the configuration windows. 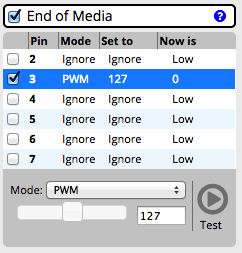 Under End of Media, click to mark the checkbox for any LED pin 2-13 that you wish to set "low" (to turn off an LED) or "high" to turn it on. The radio buttons will automatically appear pre-set as "high" for the start of the media, and "low" for "End of Media", so clicking on those is only necessary if you wish to change what is already displayed. Use the pop-up menu at the bottom of the Start of Media window to choose other options such as pwm or servo. For pins A0-A4 and pin 10, there are also options for "PWM" and "Servo". PWM stands for "Pulse Width Modulation". You can also think of it like a power setting that will control the speed of motors, and the brightness of LEDs. The Servo option is for servo motors, and is used to control the angle of the servo arm. For continuous rotation servos, the setting can control both the speed and direction of the rotation of the servo arm.